I’ll admit, for a long time I didn’t know exactly what chutney was. All I knew is that it looked like little jars of jam when I saw it at the store… but why wasn’t it with the rest of the jams? It had to be something special. Right I was. Traditionally, chutney can indicate any number of ground up, paste like condiments served along side a meal, regardless of the ingredients. 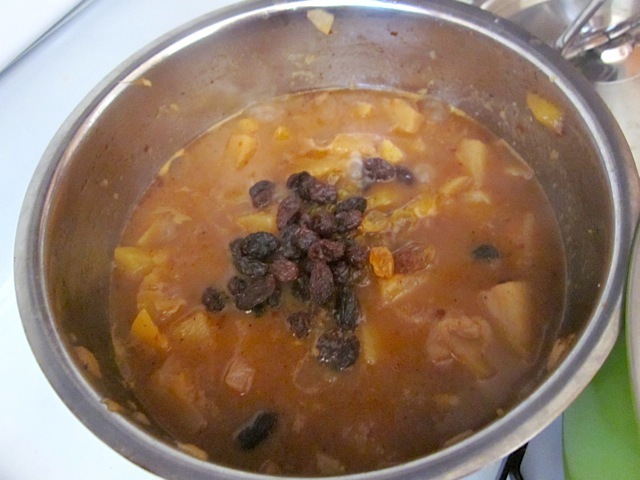 Americanized chutney is more like jam, often containing sugar, an acid component (vinegar or citrus juice), onion, some sort of fruit or vegetable and a healthy does of spices. This is the type of chutney I made and it was nothing short of magical. I made the chutney with the intent of serving it over the tandoori kebabs but have ended up eating it on crackers alone or along with a smear of cool, creamy goat cheese. I can also easily imagine this sweet, spicy and tangy chutney dressing up a simple piece of grilled fish, pork or chicken. This recipe made a huge batch (four cups), half of which I froze. Cutting it in half should be fairly easy, just use one mango, a small can of pineapple and halve the rest. This sweet and spicy sauce is excellent for meat, wraps, vegetables, and more. 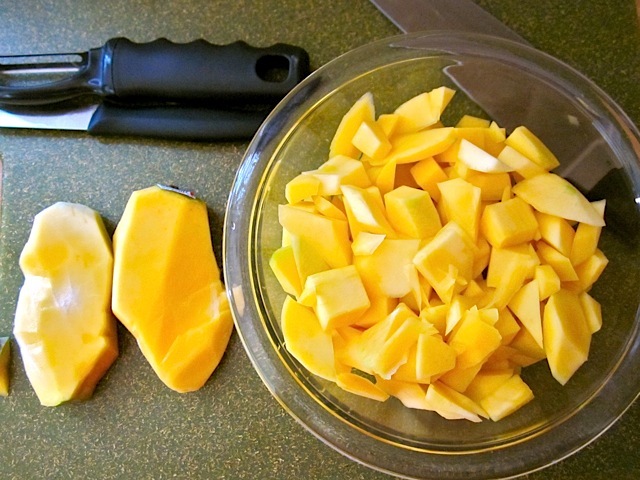 Rinse the mangoes and cut into chunks. Set the mango chunks aside. For a video demonstration on how to cut a mango, click here. Dice the onion. In a medium pot, heat the vegetable oil and red pepper flakes. When the red pepper begins to leach color into the oil and the flakes darken slightly, add the onion and continue to cook until the onion softens. As the onion and red pepper are cooking, peel a two inch knob of ginger with a vegetable peeler. Using a cheese grater, grate the peeled ginger straight into the pot with the onion and red pepper. 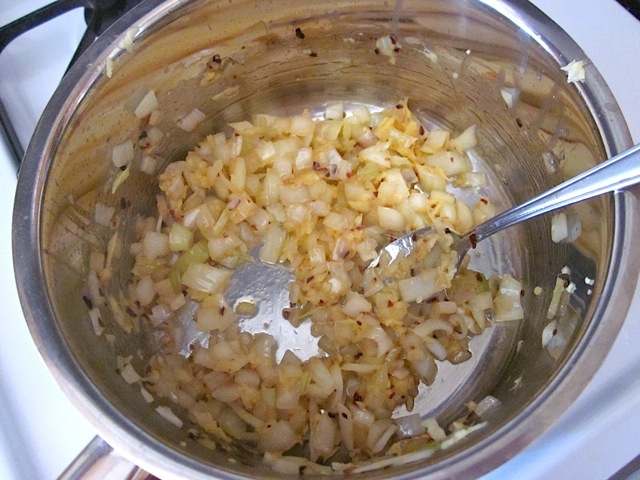 Continue to cook until the onion has softened. 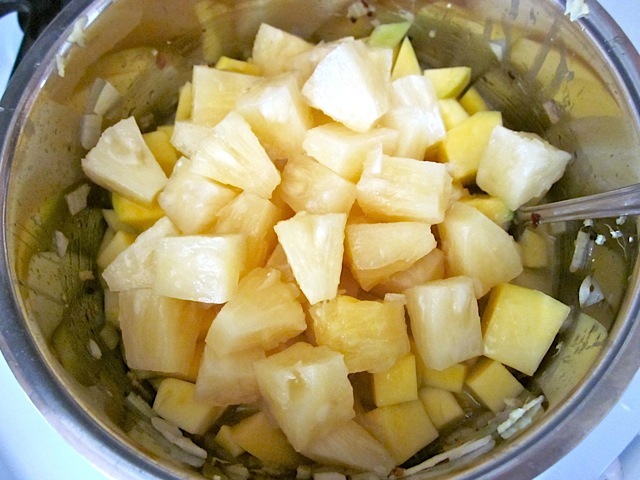 Add the mango chunks and canned pineapple (with juice) to the pot. Also add the brown sugar, vinegar and garam masala. Stir the mixture well and bring up to a simmer. Let the mix simmer heavily for one hour. Stir the pot occasionally. 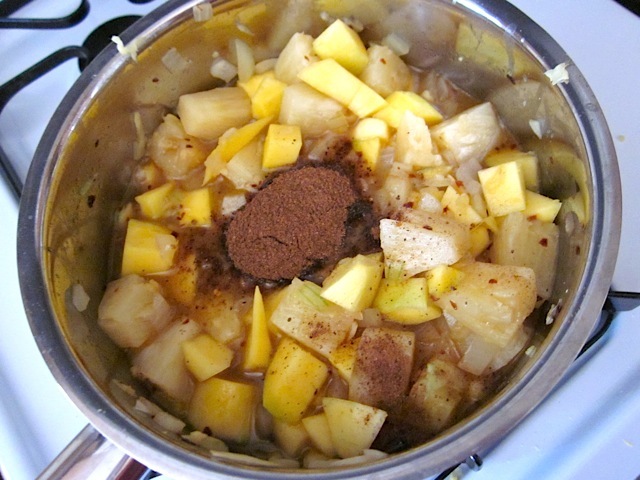 As the chutney simmers, the fruit will break down and the liquid will thicken until finally you will have a more jam like consistency. 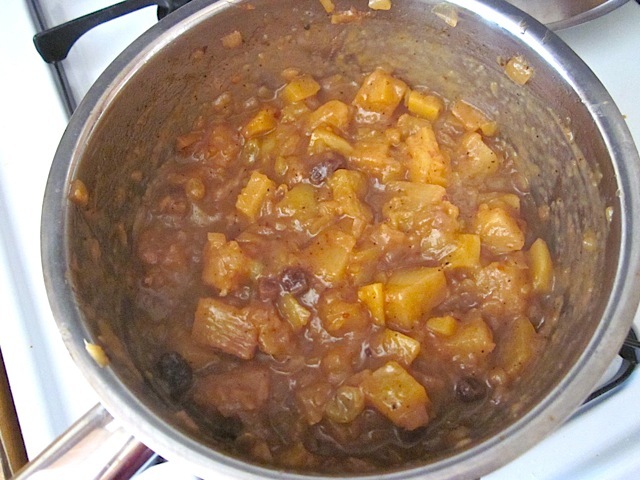 If using raisins, add them toward the end of the cooking time (about 45 minutes in). Serve hot or cold. 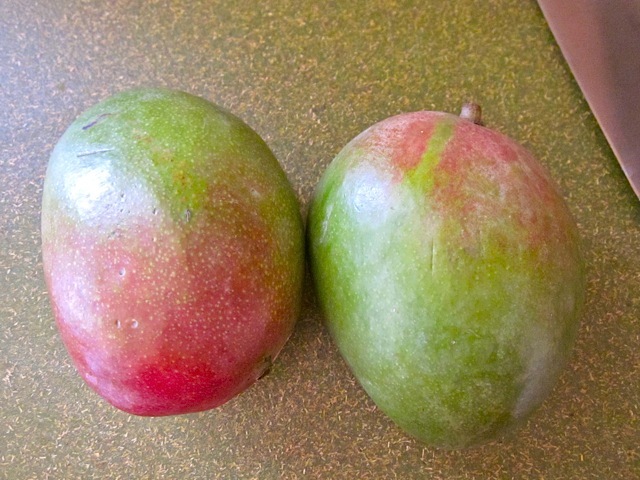 Mangoes were on sale for 99 cents each… I couldn’t resist. Remove as much flesh from the mango pit as possible and cut into chunks. Set them aside. Here is a video tutorial on how to cut a mango. 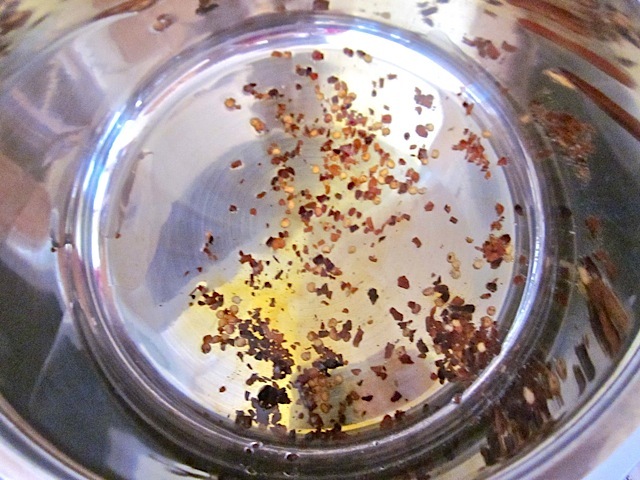 Heat the red pepper flakes in oil until they being to turn the oil red and the flakes darken slightly. Watch them closely to prevent them from burning. 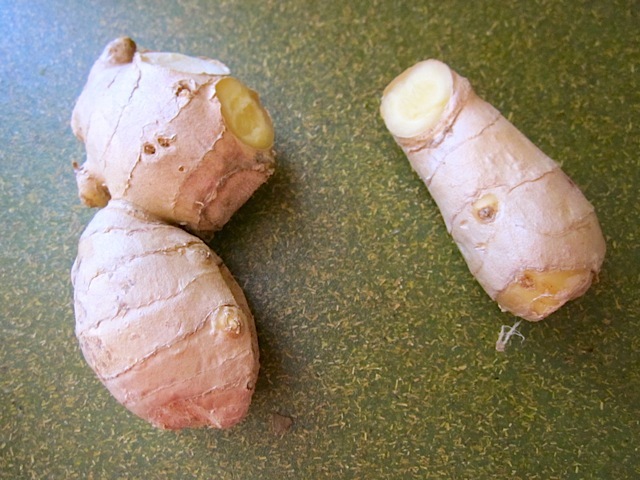 Break off a two inch knob of ginger. I needed a lot of ginger this weekend so I bought a larger piece. If all you need is one little finger, feel free to break it off at the store and only buy the small piece. It’s okay, I promise. 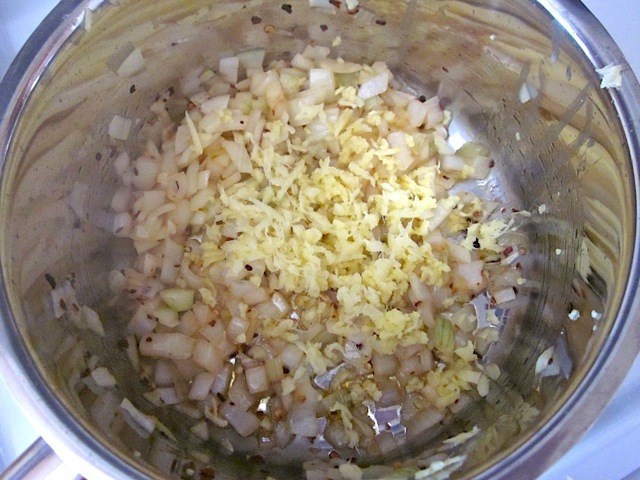 Peel the ginger then grate (using a cheese grater) straight into the pot with the onion and red pepper. Continue to cook these for a couple more minutes until it’s all softened. Next add the mango chunks and canned pineapple with its juice. I bought pineapple chunks but next time I’ll go for something smaller like crushed pineapple or tidbits. Add the brown sugar and vinegar. If you’re not a fan of vinegar you can add half the amount. Next comes the star of the show: garam masala! Stir it all up and bring it up to a simmer. Let it simmer… and simmer… and simmer.. If you’re using raisins, add them in there somewhere along the way. I added mine toward the end so they would soak up a little liquid but not dissolve into mush. 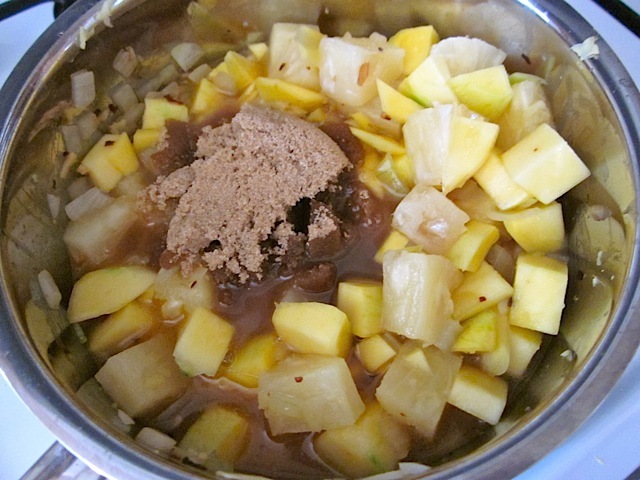 And after a good hour or so of a heavy simmer, the liquid has fully reduced to a thick jam-like consistency and the those big chunks of pineapple and mango are now soft and deconstructed. 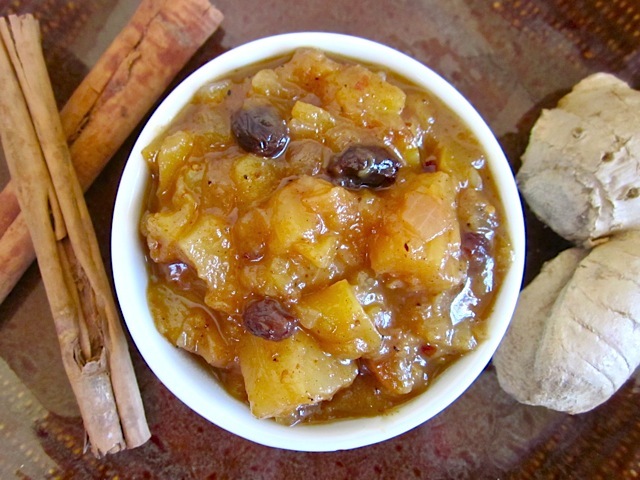 One taste of this chutney and you’ll just know how versatile it is. Share your favorite way to eat chutney! Just made this with a few modifications, used all spice instead of garam and cooked chicken in the pan while the chutney was simmering, served over rice and was great. Will be making this again! Thanks for all these beautifully presented tasty dishes. I am hooked with your blog. 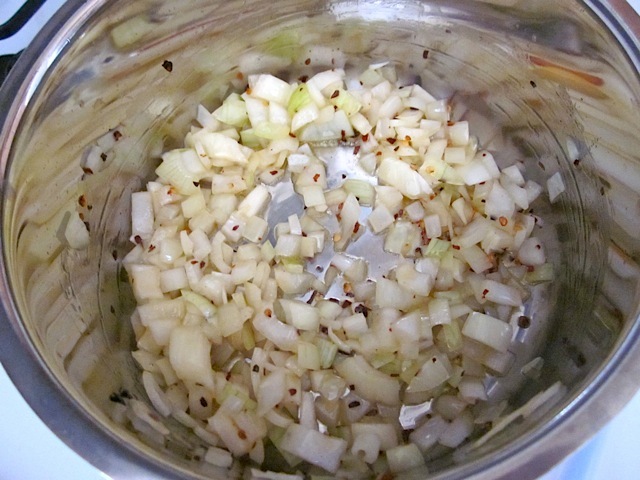 Usually we also add ‘Nigella Seeds’ (in Urdu it is called as ‘Kalonji ‘) to make this chutney. Thank you for your blog and great ideas! 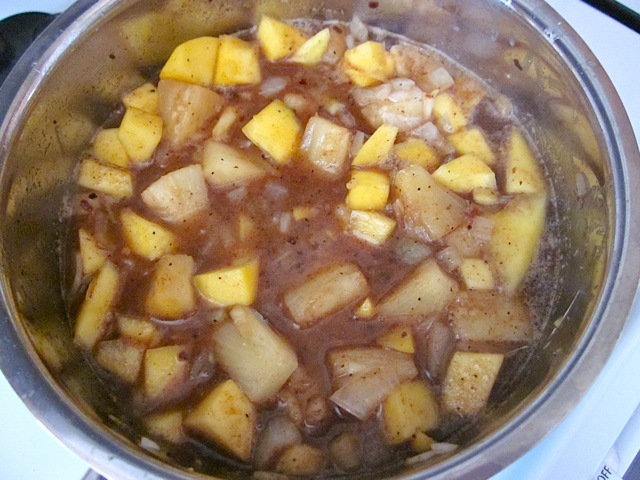 I just made a batch of pineapple chutney this week! 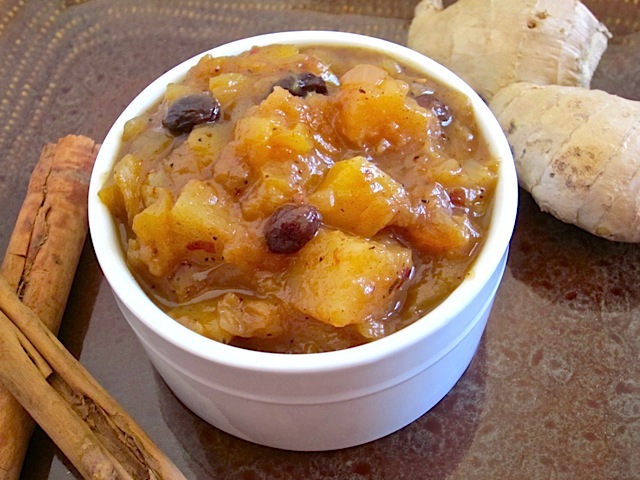 You can make this recipe with apple and pumpkin instead of the pineapple and mangoes. The pumpkin chutney is delicious with Stilton (an English cheese), any strong cheese, lamb curry, mix with some rice, venison. 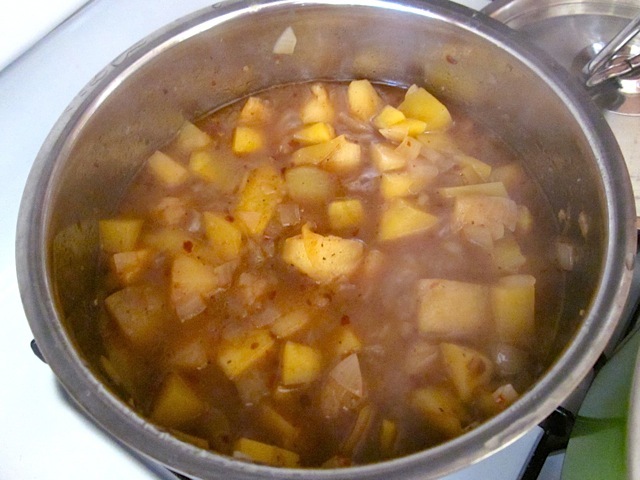 The pineapple chutney is good with fish and chicken, indian meals, mix with rice. This looks AMAZING. I’ll try it soon!